At Seabrook®, our multi-disciplinary treatment teams provide holistic adult addiction services to address the physical, emotional and spiritual impact of alcoholism and substance misuse. Our structured, nurturing programs are grounded in the 12-Step Recovery Principles and designed to foster the changes needed to start and sustain a clean, sober life. When men and women are in denial about substance abuse or will not seek help, their Seabrook journey may begin with family intervention. Seabrook’s highly trained and certified family intervention specialists help you create a plan to address your loved one and get to the root of the problem with respectful, honest communication techniques. In most cases, family intervention results in immediate admission to detoxification, medical stabilization, alcohol or drug rehab or another clinically appropriate setting. Also called “medical stabilization,” this phase occurs prior to entering recovery phase one. Detox gives men and women a chance to cleanse their bodies of toxins and prepare mentally and emotionally for active rehab. Not including detox, Seabrook patients spend 28 to 35 days in our live-in, primary care environment. A step down from primary care, Extended Care for Women and Extended Care for Men are long-term sober living programs on the grounds of our luxurious NJ estate. Stays are a minimum of 12 months, which allows clients to apply the tools and skills learned in phase one. Extended care mimics a “real world” environment with open access to 12-Step self-help meetings, daily group counseling, relapse trigger education and more. Seabrook’s aftercare program provides a minimum of one therapy meeting per week for eight months. 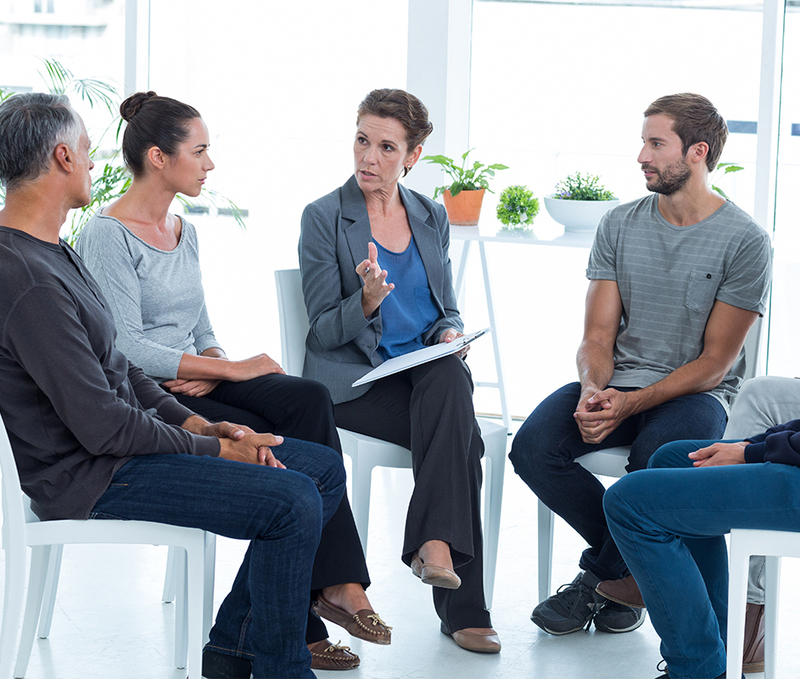 Our clinical staff embraces the principles of Alcoholics Anonymous (AA), Narcotics Anonymous (NA) and other 12-Step programs throughout every treatment phase. In addition to residential, extended care and outpatient services, Seabrook’s network of campuses also provides family treatment services. We believe that, whenever possible, family healing is essential to successful rehab outcomes. Family services include therapy, visitation, addiction education and more. EMDR: Eye movement desensitization and reprocessing treatment activates components of traumatic memory and pairs them with alternating bilateral or dual-attention stimulation. Over time, it is believed this process facilitates normal information processing. Brainspotting: This psychotherapy approach is based on the belief that a person’s field of vision can locate “brainspots,” or eye positions that correlate with neural and emotional experiences. By maintaining eye fixation, therapists can heal issues held deeply in the non-verbal, non-cognitive areas of the neurophysiology. Equine-assisted therapy: Equine-assisted therapy teaches clients to better understand themselves by interacting with horses. As pack animals, horses sense and respond to human feelings and provide a mirror, of sorts, for clients. Equine therapy encourages responsibility, trust-building and constructive processing in the context of a non-judgmental relationship. Therapeutic massage: Therapeutic massage is conducted through clothing in a quiet, serene environment. The session focuses on the upper body—head, neck, shoulders, back and arms. Each massage session creates a nurturing space where clients can relax and experience a release of tension and calming of the nervous system. Acudetox: Acudetox is an alternative therapy used to balance the body without medication. During the first 24 to 48 hours of treatment, our wellness specialists apply ear seeds at acupressure points in the ear. Ear seeds reduce preexisting or recovery-related physical and emotional symptoms. During the second week of treatment, acupuncture is applied to locations in the ear to encourage continued body balance, pain relief and healing. Drumming circle: Drums are dynamic, interactive tools that produce physiological, psychological and social stimulation. Drumming enhances recovery and incorporates the 11th Step of prayer and meditation by encouraging nonverbal expression of thoughts and feelings. Yoga: Yoga poses are coordinated with the 12 Steps, helping patients practice physical and emotional surrender. Through practice, yoga helps patients embody the 11th Step: quieting the mind, being open to guidance, identifying a Higher Power and experiencing serenity. Yoga unites the body and mind by linking breath to mindful movement. Mindfulness meditation: Mindfulness groups occur regularly during primary treatment. During mindfulness, an individual focuses their attention on what is happening in the present moment. This process of meditation is a helpful way to deal with the feelings arising from past regret or future worries. Sleep hygiene: Sleep problems are common during withdrawal. During sleep hygiene group gatherings, our experienced clinicians educate patients about sleep cycles and teach them healthy practices for improving sleep without the use of pharmacological sleep aids. Stress management: Using didactic presentations and experiential exercises, clients learn to manage everyday stressors related to recovery, relationships and other life areas. Adventure ropes courses: Seabrook’s high and low ropes courses teach participants to take healthy risks, develop leadership qualities, communicate effectively, coach others and solve problems. Fitness center: Routine exercise can reduce stress, alleviate depression and anxiety, and improve sleep quality. Seabrook’s fitness center includes recumbent bikes, elliptical trainers, treadmills, free weights and the Precor Universal Machine. Recreation & leisure skills group: Members of this group learn to incorporate meaningful leisure activities into daily recovery. This group also facilitates team building and the development of trust and communication skills. Seabrook is a member of the National Association of Addiction Treatment Providers (NAATP), an industry leader committed to strong ethical and professional practices. NAATP represents addiction providers throughout the policy-making community, and advocates for evidence-based, outcome-oriented recovery interventions. Our New Jersey substance abuse facilities affirm and repair the lives of individuals and families stuck in a destructive pattern of chemical dependency. Here in our safe, homelike environment, Seabrook staff blends addiction education, 12-Step Recovery Principles and deep clinical expertise to deliver award-winning recovery care. When you or someone you love is ready to begin the journey to lasting sobriety, call our 24-hour Helpline: 800.761.7575. For your convenience, you can also request information about adult addiction treatment services online or chat live with a Seabrook admissions specialist.